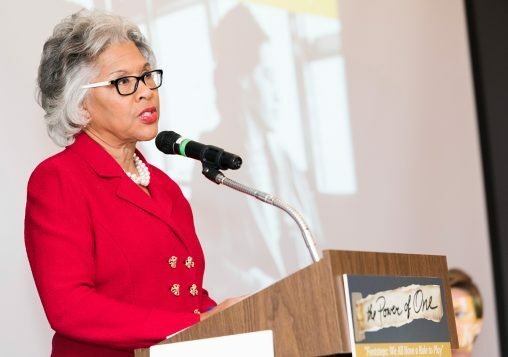 Joyce Beatty ’75 uses the skills she learned in Wright State’s mental health counseling program as a leader in Congress. Joyce Beatty had two primary reasons to pursue a master’s degree at Wright State University in the 1970s. One reason was the university’s mental health counseling program, which was state of the art, with an excellent faculty and curriculum. The other was personal: The Dayton native’s father, Herman Reeder, was a brick mason who helped construct Allyn Hall in the early 1960s. During that time, few African Americans held such positions, so Reeder’s work on campus and around the Dayton community were a point of pride for his family. She described enrolling at Wright State as “one of the best decisions I could have made” and one that helped advance her career — which has spanned positions in local, county, and state government, private practice, academia, and the U.S. House of Representatives. In November 2018, Beatty was elected to her fourth term in Congress representing the Third District of Ohio around Columbus. “It was growing and I was growing,” said Beatty, who graduated in 1975 with a master’s degree in mental health counseling. The education she received allowed her to make a difference throughout her distinguished career. The counseling program helped Beatty further develop her proactive vision, analytical mind, and ability to assess not only people but situations. Prior to her election to Congress in 2012, Beatty was the senior vice president of outreach and engagement at The Ohio State University and served five terms in the Ohio House of Representatives. During her tenure in the Ohio House, she became the first female Democratic House leader. Her legislative accomplishments as a state lawmaker include bills requiring financial literacy in Ohio’s public school curriculum, expanding STEM education, and helping under- and uninsured women access breast and cervical cancer treatment. In Congress, she serves on the House Committee on Financial Services, the Housing and Insurance and Oversight and Investigations subcommittees, and chairs the House Financial Services Committee’s new Subcommittee on Diversity and Inclusion, which aims to promote diversity in the banking industry. Leading this, she said, will allow her to advocate for more people and examine disparities within the financial services industry. As a member of the Financial Services Committee, Beatty has raised concerns about the lack of women and minorities in leadership roles in the Federal Reserve and other financial services institutions. She has twice introduced legislation — modeled on the NFL’s Rooney Rule — that would require at least one candidate who is a woman or a minority to be interviewed for a vacancy among Federal Reserve Bank presidents. Though her bill has not passed, she was pleased when, in 2017, Raphael Bostic was named president of Atlanta Federal Reserve, making him the first African American to hold such a position. Beatty is also cofounder of the bipartisan Congressional Civility and Respect Caucus, which encourages members of Congress to act with civility and respect in their political discourse. One of her goals as a congresswoman is to be an advocate for women, because “when women succeed, America succeeds,” she said, referring to a line she suggested President Obama include in one of his State of the Union Addresses. At the start of the 116th Congress, which convened in January 2019, Beatty said, she looked forward to serving both in the majority and with a record number of women representatives.